Havergal Brian's music may not feature in the 2010 BBC Proms season, but as a consolation prize the composer has had a bus named after him in Brighton. 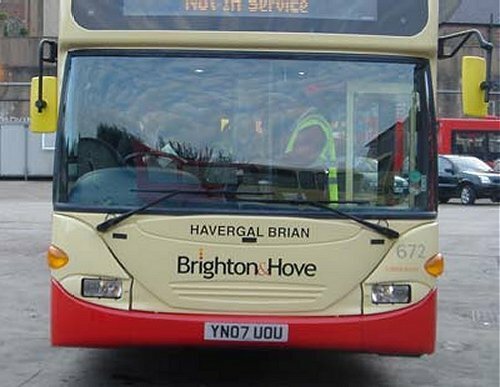 He joins other musical celebrities including Ralph Vaughan Williams (no symphonies at the 2010 Proms...) whose names adorn Brighton's bus fleet. That quote and photo is from my April 2010 post A bus named Havergal Brian. And zut alors! the 2011 BBC Proms season, which was announced today, features a rare performance of Havergal Brian's Symphony No 1 'The Gothic'. But, of course, I am not arrogant or daft enough to claim credit for helping make Proms history, although others are. And did I mention not only no Vaughan Williams symphonies in the 2011 Proms, but not a single note of any of his music? More Havergal Brian here.